Gloria delivers entertainment experiences that delight audiences of all types. Her abilities as a dancer, a performance artist, and instructor are multi-disciplinary and multi-cultural which makes her work versatile, unique and engaging. Click on tabs below for more information on different genres and entertainment options. East Indian, Afghani, Middle Eastern, North African dances and entertainment. 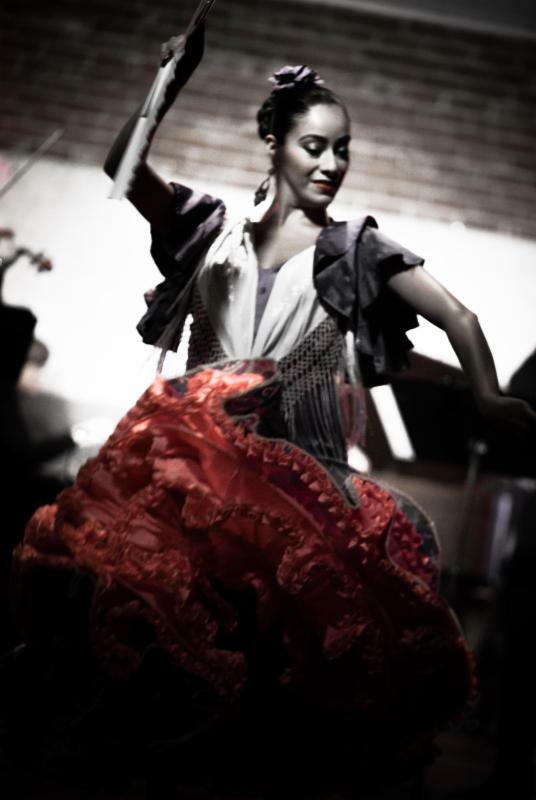 Flamenco, Salsa, Tango, Samba, Mexican Folkloric dances and entertainment. Hip Hop, Cabaret, Burlesque, Modern and fusion dance shows and entertainment. Gloria is currently available to teach workshops, choreography, private lessons, and semi private lessons. More details on pricing is available on her "Bookings" page. Click below for more about Gloria's teaching philosophy and contact her directly for further information. Gloria posts the most recent information on social media so give her a follow. Pop-Up Bellydance performances by Gloria, Rachel & Vilia. 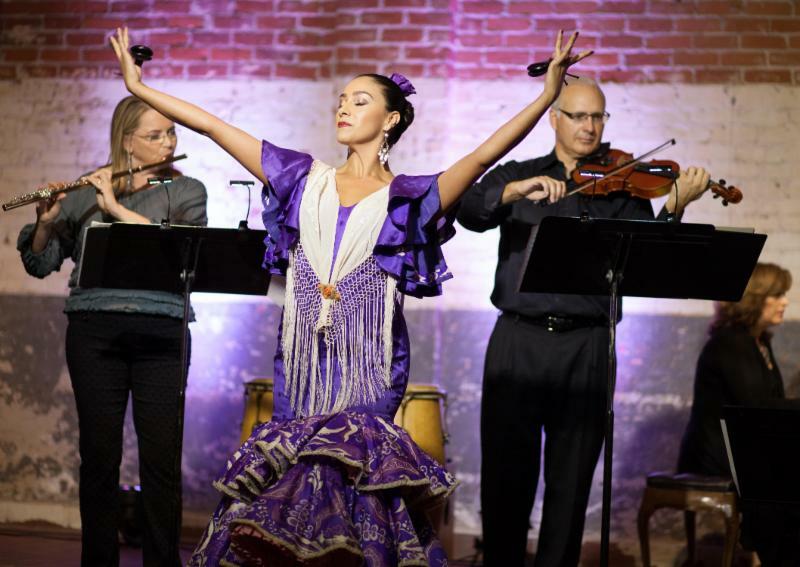 Gloria dancing flamenco at the Harmony and Motion Concert. Divine Desi Dance booked to perform Bollywood dance at an Indian Wedding reception. Solo Bellydance show by Gloria. Pop-up Bellydance shows by Gloria, Rachel & Vilia. Gloria will be entertaining guests with Bellydance and exciting props throughout Meze Greek Fusion Restaurant. One show at 8:00pm and another at 9:30pm. Pop up Bellydance shows by Gloria, Rachel & Vilia. Vilia, Rachel and Gloria posing before a live music bellydance show at Zorba's Greek Restaurant. Classical Indian Dance & Bollywood Dance Classes at Malashock's Summer Dance Teen Intensive. Flamenco classes with Gloria at SDCYB. Free BollyFit Class tomorrow. Pre registration required. Don't miss out on this fun and exciting dance workout opportunity! Weekly bellydance classes at on of San Diego's best social dance studios. Gloria will be teaching three dance classes back to back at UCSD RIMAC arena Saturday mornings during each quarter. Weekly Bellydance Classes with Rachel. Gloria as a T.A. Gloria is teaching Bellydance and Bollywood at this year's Free Day Of Dance! Lokk at schedule for more information. Salimpour Diversity Workshops is Brussels. Flamenco Classes for the advanced Ballet students of the San Diego Civic Youth Ballet. Join Gloria in and intense and exciting Salimpour based Bellydance class every Saturday morning. You can register through UCSD RIMAC. Available for national and international bookings. Spice up every event with a customized live music and dance show! Gloria and her one of a kind shows are available for weddings, corporate events, birthdays, anniversaries, cultural events, concerts, nightclubs, restaurants, house parties and other private and public venues. Shows include multiple styles, authentic costumes, diverse props and incomparable exciting and talented performers. Gloria and her companies are available for frequent restaurant, hookah lounge, dinner show and nightclub bookings in all dance and music genres offered. Must book at least one week in advance. Shows last up to 30 minutes in length. Classes are taught by Gloria Lanuza in multiple dance genres and world music. Classes and workshops include technique, choreography, history, and cultural understanding. Gloria is available to teach at Universities, High Schools, Middle Schools, Elementary Schools, Dance Studios, Private homes and other venues. Gloria's choreographies can be used for showcases, pageants, weddings, birthdays, anniversaries, quinceraneras, competitions and concerts. Gloria teaches private and semi private lessons in multiple dance styles including Flamenco, Salsa, Bellydance, Bharatanatyam, Bollywood, Modern, Ballet and Pilates. Dance lessons include technique and choreography. Students must commit to at least two months of lessons. For semi private lessons Gloria accepts up to 5 students per class. Please inquire for semi private class prices. Lessons can be in your own home, Gloria's home studio or other locations. Call (619) 621–0950 or e-mail glorialanuza@gmail.com to discuss event and show details for your special event and to inquire about rates and availability. Available for national and international travel. Fill in the form below to give Gloria more information about you and your exciting upcoming event.